Explaining Your Code To An Inanimate Object Is A Programming Trick Known As What? When You Mishear Song Lyrics You Are Experiencing? Rubber duck debugging is an informal method of debugging code that programmers have long relied on as a simple and cost-effective way to catch code errors. The programmer, once they have finished coding, takes a moment to explain the code, line by line, to the rubber duck on their desk (or whatever other inanimate object, like a figurine or toy, they have handy). By poring over their own code and explaining it out loud to the inanimate object, the programmer will often times catch errors in the code as the mismatch between what the program is supposed to do and what the code on the screen actually does is made more apparent—the programmer’s version of a student reading their term paper out loud to check for errors. 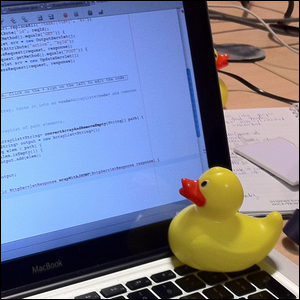 Other terms for rubber duck debugging include confessional debugging and cardboard programmer.